Orbis main town, near the Free Market. Orbis is very bright and cheerful, with a mythical appearance. Most of Orbis' residents are fairies, with a friendly relationship to the fairies of Ellinia. It has 2 main sections, the Orbis Tower and the Cloud Park. Also available in Orbis is the guild headquarters, where a player may travel to create a guild. Orbis is kept afloat via Lithium stones shipped in from Magatia, enchanted with the powers of Alchemy. The fairies here are also on good terms with the Zenumists of Magatia. These same stones power the ships that travel to Victoria Island and other areas, too. 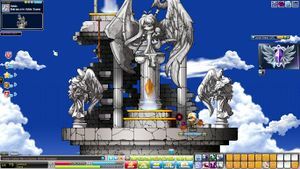 Orbis Station acts as the main gateway "airport" of MapleStory, allowing transport to Victoria Island, Ludibrium, Leafre, Mu Lung, Ereve, Edelstein, and Ariant. The fifth map in Orbis Cloud Park. The Cloud Park is as its name suggests: an area that is sort of like a park, situated on clouds. It extends quite aways, branching off into two areas, one featuring the "kitty" and one featuring Pixies and Nependeaths. The "kitty" area features maps that contain Jr. Cellions, Lioners, and Grupins, as well as their "senior" forms. The kitties are grouped into Gardens according to color (Garden of Red, Yellow and, oddly, Green). Further then, are Jr. Lucidas and Lucidas, evil kitties. Lucida are the strongest monsters found in Orbis. Lucida also can be found in Zipangu's Mushroom Shrine. At the end of this area, there is now a boss, called Eliza, which is fairly powerful and has the ability to summon Jr. Lucida to aid it. The "pixie" area features maps that contain Star, Lunar, and Luster Pixies, as well as Nependeaths and Faries. Pixies are often hunted for exchange pieces and a number of quests. Fieries are hard to defeat because they have a mystic magic skill. Nependeath are often hunted for exchange quests. Orbis Tower Entrance. The portal on the left leads to Orbis Tower. Orbis Tower is a tower with 13 accessible floors that spans the vertical gap between Orbis, El Nath, and Aqua Road. 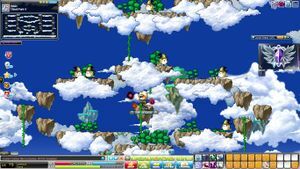 In the Champions patch, the Black Mage attacked several locations of Maple World, including Ereve and Orbis Tower, which destroyed floors 9-15. With this change, the Orbis Magic Spot now accepts 5,000 mesos as payment. Travelling from floor 15 to 9 and vice versa is free. 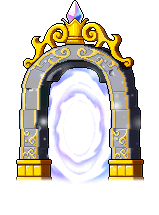 Players may use an Orbis Rock Scroll to instantly teleport between the 20th and 1st floors as a fee waiver, if in possession of any. These Scrolls were obtainable via Huckle's Magic Ingredients quest, which has been removed. The tower features monsters such as Jr. Sentinels, Sentinels, Ice Sentinels, Fire Sentinels for the Orbis type, Leatties, Dark Leatties and Jr. Pepes for the El Nath type and Scuba Pepe for the Aquarium type. At the First Floor, a door leads to subsequent basement floors, eventually plunging underwater to the town of Aquarium. Orbis : Orbis Exchange Quest NPC. Orbis : Orbis Event NPC. Orbis : Orbis Quest NPC. Orbis : Orbis Storage NPC. Orbis : Orbis Monster Carnival Exchange. Orbis : Orbis Battle Mode Advertising. Orbis : Orbis and Orbis Park Party Quest and Special Map Transportation NPC. Orbis : Orbis World Tour transportation NPC. Orbis : Orbis Scroll seller. See above for prices. Orbis : Orbis Weapon Store Sells weapons. Orbis : Orbis Weapon Store Sells armor. Orbis : Orbis Weapon Store Sells potions and consumables. Orbis : Orbis Station Entrance Transportation Info. Orbis : Orbis Station Entrance Sends you to whichever station you're headed to. Orbis : Orbis Station Entrance Transports you to Singapore for 300,000 mesos. Orbis : Orbis Station Entrance Lets you rent airplanes for a fee. Orbis : Station <Victoria Bound> Allows you to head to Victoria Island. Orbis : Pre-Departure <Victoria Bound> Allows you to exit the boat to Victoria Island. Orbis : Station <Ludibrium> Allows you to head to Ludibrium. Orbis : Before the Departure <Ludibrium> Allows you to exit the boat to Ludibrium. Orbis : Cabin <To Leafre> Allows you to head to Leafre. Orbis : Before the Departure <To Leafre> Allows you to exit the boat to Leafre. Orbis : Cabin <To Mu Lung> Allows you to head to Mu Lung. Orbis : Station <To Ariant> Allows you to head to Ariant. Orbis : Before the Departure <To Ariant> Allows you to exit the boat to Ariant. Orbis : Station <To Ereve> Allows you to head to Ereve. Orbis : Station <Edelstein Bound> Allows you to head to Edelstein. Orbis : Orbis Park Quest NPC. Orbis : Orbis Park Item Repair NPC. Orbis : Orbis Park Pet food and pet guide seller. Orbis : Orbis Park Quest NPC. Also sends you to Chryse. Orbis : Orbis Park Explains the family system. Orbis : Orbis Park Increases buddy list capacity. Also found in Lith Harbor. Orbis : Orbis Plastic Surgery Changes your face with a VIP Face Coupon. Orbis : Orbis Plastic Surgery Changes your face with a Face Coupon. Orbis : Orbis Plastic Surgery Changes your eye color with a coupon. Orbis : Orbis Plastic Surgery Quest NPC. Orbis : Orbis Hair Salon Changes your hairstyle with a VIP Hair Coupon. Orbis : Orbis Hair Salon Changes your face with a Hair Coupon. Orbis : Orbis Skin-Care Changes your skin color with a coupon. Orbis : Cloud Park I Quest NPC. Orbis : Old Man's House Quest NPC. Orbis : Cloud Park VI Quest NPC. Orbis : Orbis Tower 20th, 16th, 8th, and 1st floors. 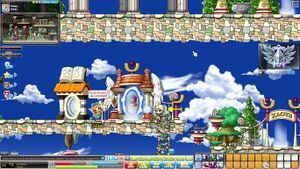 Allows you to teleport to the other spots in Orbis Tower for 5,000 mesos. Orbis : Orbis Tower 16th Floor Quest NPC. Orbis : Orbis Tower <Hughes's Laboratory> Quest NPC. This page was last edited on 23 November 2018, at 01:19. This page has been accessed 138,536 times.